Nurturing and soothing eye care moisturizer for all skin types. 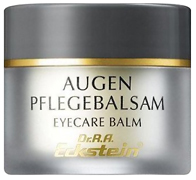 A rich balm which prevents the formation of wrinkles of the dry and stressed eye area in an early stage. A new combination of skin-activating ingredients improves the elasticity and tone of the skin, contributing to a soft and supple appearance. Contains Lanolin, Ceresin, Bisabolol, Hyaluronic Acid, Vitamins A + E and Wheat Germ/Bran Extracts, Panthenol and natural plant oils. Instructions: After facial cleansing, apply a thin layer to the eye area. For use up to twice daily. May be used in combination with Nano Eye Gel for enhanced results.